In 1975, Freedom House ranked only 25 percent of the world's countries to be "politically free." Three decades later, the proportion had increased to 46 percent, with 122 electoral democracies. Democracy may have taken root in Eastern Europe, East Asia, Latin America, and much of sub-Saharan Africa, but the Middle East has largely been left behind. Except for Israel, Middle Eastern countries have long histories of authoritarianism, influenced by both culture and religion. In modern years, this has manifested itself in the rise, if not of direct military rule, then of states supported by militaries focused more on inward threats than on external enemies. Middle Eastern militaries, whether in Algeria, Egypt, or Turkey, have served as the main bulwark against the spread or empowerment of Islamists. However, Western policymakers must prepare for the day that the regional militaries will switch sides, casting their lot with Islamists rather than more secular autocrats. Today, the heroes of the masses are often Islamic leaders. After the 2006 Israel-Hezbollah war, polls suggested that Hezbollah secretary-general Hasan Nasrallah was among the most admired Arab political leaders. Beginning in the 1960s, many academics analyzed how Asian and African states changed from traditional societies to modern, developed nation-states. Other scholars focused on the nature of control and political survival in these new states. In the Middle East, during this period, the military became the predominant power within emerging nation-states. First in Turkey, then in Iran and Egypt, and later in Iraq, Yemen, and Libya, military leaders seized power and established or abolished monarchies. Military leaders also retained predominant power in Syria, Algeria, and Tunisia. In Jordan and the Persian Gulf emirates, more traditional leaders survived only by forging close ties with the military and establishing vast security services. In some countries, the military coexisted with traditional Islam and even Islamists. During the Cold War, in Saudi Arabia and Iran, Islam was seen as a force resistant to communism. Indeed, while demands for U.S. apologies for the 1953 coup against Prime Minister Mohammad Mosaddeq are now a staple of the Islamic Republic, the irony is that Iranian Islamists and the Central Intelligence Agency found themselves sharing opposition to the populist premier because of his closeness to the Iranian communist party. So long as extremists—the Muslim Brotherhood or Ayatollah Ruhollah Khomeini's followers, for example—were contained, Islam was a positive, non-threatening force. With time, however, Islam grew to threaten military stability and rule. The ramifications of this shift in power politics are great. After World War I, Arab leaders created nation states alongside British and French mandates. This process was gradual and came at the expense of the pan-Islamic alternative. Pan-Arabism grew to become the dominant ideology even as Arab leaders divided Arab-speaking areas into separate countries. Almost a century later, pan-Arabism is on life-support, paid lip service to only at Arab League meetings and among some intellectuals and artists. A similar rise in Islamist sentiment has come at the expense of ethnic identity in Turkey, Pakistan, and Somalia. For the masses, Islamism is simply more attractive. In Algeria, Pakistan, Somalia, and Yemen, Islamist movements continue to threaten regime survival as these states rely increasingly on the military or, in Somalia's case, militias, to prevent an Islamist takeover. In Arab countries today, the "street" has little political significance. Whereas the nation-state was alien to Middle Eastern political culture, authoritarian regimes and patrimonial leadership have long been part of the regional heritage, in which religion demanded submission to God and the leaders who claimed to be his representatives on earth; culture demanded similar submission to tribal and political leaders. Patrimonialism makes authoritarian regimes resistant to democratic reform. Many political leaders today thrive on personality cults. In most Arab countries, Iraqi Kurdistan, and Iran, ordinary citizens feel compelled to display portraits of national leaders in schools, offices, and sometimes even private homes. In Turkey, the same phenomenon occurs with the Atatürk cult. As they developed, Arab states became marked by political corruption, a high level of army involvement in shaping and managing policy, weak political institutions, a lack of democratization, and an absence of formal decision-making institutions. Together, these led to arbitrary, centralized government leadership and a maximization of the role of the military in politics that placed them almost in hierarchical command. There may be constitutions, political parties, and parliaments, but these are insignificant and often lack influence. In Tunisia, for example, President Zine El Abidine Ben Ali defeated two opponents in October 2004 elections with 94.5 percent of the votes cast. Likewise, in the September 2005 Egyptian elections, Hosni Mubarak defeated his two main opponents, Al-Ghad party leader Ayman Nour and New Wafd party leader, Nu'man Guma'a, winning 88.6 percent of the vote. Throughout Islamic history, prominent heroes have come from the military. Squares, buildings, and universities are still named after the twelfth-century Kurdish warrior Salah ad-din al-Ayyubi (Saladin). Egyptian president Gamal Abdel Nasser may have been a dictator, but he did enjoy popular appeal. So, too, did Syrian president Hafiz al-Assad and Iraqi president Saddam Hussein. Today, however, the heroes of the masses are often Islamic leaders. Iranian revolutionary leader Ayatollah Ruhollah Khomeini captured the imagination of the Third World. 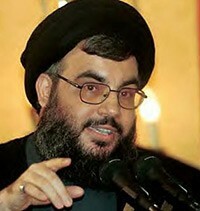 After the 2006 Israel-Hezbollah war, polls suggested that Hezbollah secretary-general Hasan Nasrallah was among the most admired Arab political leaders. If, through most of the twentieth century, the dominant political trend in the Middle East involved the waning of the traditional tribal elite and their replacement by the military, in the late twentieth and early twenty-first centuries, the defining trend appears to be the replacement of authoritarian military leaders like Egyptian president Mubarak by Muslim movements. In many countries, the military provides a bulwark against unconstrained Islamism. Indonesian president Muhammad Suharto used the military and an iron fist to constrain Islamist movements in the world's most populous Muslim country. In Turkey, the military has long served as the guarantor of the constitutional separation of mosque and state, stepping in most recently in 1997, suspicious of the agenda of Islamist prime minister Necmettin Erbakan. In Syria, the military protects a relatively secular and minority 'Alawi regime against a majority Sunni population susceptible to Islamist populism. When the Muslim Brotherhood grew too vocal and active in Syria, President Hafiz al-Assad ordered his army to raze its stronghold in Hama, killing perhaps 20,000 civilians. After Islamists won the 1991 elections in Algeria and, as is often forgotten, promised to change the constitution to prevent future polls, the Algerian army intervened. H. Osman Bencherif, the Algerian ambassador to the United States later explained, "It was the lesser of two evils: Democratic principles would be violated by cancelling the second round just as they would be seriously threatened by a theocratic, authoritarian, Islamist takeover. The army took a difficult step, but one that saved Algeria from an even worse fate." A new study by Steven Cook confirms the connection between the military establishment and the stability of the regime. Conversely in Lebanon, where the military is weak, Hezbollah has constrained political development as it tries to impose Shi'i norms and a radical foreign policy onto Lebanese society. What If Middle Eastern Militaries Switch Sides? Islamism seeks to replace the modern mechanisms of state with an Islamic social and cultural framework. In some cases, the military either declares its neutrality or joins with the Islamists to topple the secular order. This happened most clearly in Iran where the army's declaration of neutrality enabled the triumphal return of Khomeini in February 1979, and also in Sudan when, in June 1989, Hasan 'Abdullah at-Turabi's National Islamic Front cooperated with the military to take over the regime. After the Egyptian army defeated the active Islamic insurgency in the late 1990s, the Egyptian government moved to co-opt many of the Muslim Brotherhood's potential recruits by Islamizing education and society. While many commentators persist in describing the Palestine Liberation Organization (PLO) and Fatah as secular, especially in juxtaposition to Hamas, the fact is that the late PLO chairman Yasser Arafat Islamized Fatah through the 1990s. Since the 1960s, the Pakistani military has allied itself with Islamists. Pakistan was founded nominally on the basis of religion, but the country's founding father, Muhammad Ali Jinnah, was more secular than religious in orientation. Pakistan is an ethnically diverse country, and first Pushtun nationalism—manifested in the Pushtunistan struggle of the 1950s and 1960s—and then Bangladesh's secession in 1971 spurred the Pakistani leadership to promote Islam as an antidote to ethnic nationalism. Indeed, this was the major motivation behind Islamabad's support for the Taliban. In recent years, the Pakistani government has struck deals with the Taliban in both North Waziristan and Swat. While the Syrian government defeated an Islamist insurgency in the 1980s, and the Egyptian and Algerian governments defeated Islamist insurgencies in the 1990s, the chance for a secular regime to emerge victorious today is not as certain. Turkey provides a troubling example. The Turkish military long served as the defender both of Turkish secularism and democracy. But, as part of the European Union accession process, Turkey's Grand National Assembly passed a reform package that loosened the power of the military in the domestic political sphere by, for example, placing the country's powerful National Security Council under civilian control. With the military no longer in a position to protect secularism, Prime Minister Recep Tayyip Erdoğan has moved to consolidate Islamist control, not only in political circles, but over ministry bureaucracies, the educational system, and the media. Should the Turkish government decide to abandon the European Union accession process—and its commitment appears to be wavering—then it will already have succeeded in marginalizing the one force that would prevent it from casting aside Kemalism for an Islamist state. Islamism and Democracy: Mutually Exclusive? A growing number of mainstream foreign policy voices—former New Republic editor Peter Beinart and Carnegie Endowment scholar Robert Kagan, for example—advocate for engagement with the Muslim Brotherhood and other Islamists. While Beinart and Kagan may be swayed by the rhetoric of democracy and appeals to electoral fairness, the new Islamic wave could undercut not only the stability of traditional military regimes but also meaningful reform and liberal opposition. The problem distills to conflicting concepts of legitimate, authoritative government. In the West, in the mid-eighteenth century, Jean Jacques Rousseau outlined the concept of a social contract between a people and its government. Islamists, however, reject the idea of a social contract in the Western sense. According to Arab culture and many Islamic tenets, legitimacy is granted exclusively to the leader. While some majority Muslim states—Egypt and Iran, for example—have long and cohesive histories, many others, whether in Africa, the Middle East, or elsewhere in Asia, have weak national identities easily rendered weaker by clerics appealing to ties with the Muslim umma (community) rather than national sentiment. Civil society cannot defend itself against Islamism enforced and protected by the military. Especially within the Arab Middle East, civil society is weak. The problem is not the absence of organizations but rather their independent function. Even if there are political parties, professional and civic associations, and opposition groups, they have little influence on governance and decision-making. Parties operate more on behalf of the regime as mass organizations for political mobilization while opposition is mostly illegitimate and works underground. The 2002 Arab Human Development Report, for example, found deficits in freedom, knowledge, and opportunities for women. In Arab states, Iraqi Kurdistan, and Iran there are few independent nongovernmental organizations. Most groups describing themselves as NGOs are, in reality, "GONGOs," government-operated nongovernmental organizations. Nor are labor unions in the region independent of government control. Social suspicion and political cynicism are dominant, and the cultural inclination is toward conformity of thinking and operational loyalties to the extended family and clan. When the chips are down, identifying oneself with kinship is much deeper and more significant than identification with any other group, including the state or its political institutions. With the exception of the West African nation of Mali, no majority Muslim state is considered "free" in Freedom House's Freedom in the World survey. Democratic forces in Arab countries are either nonexistent or lack the power to be credible. There are many values in Arab political culture that contradict democratic principles, and the Middle East and North Africa have proven particularly resistant to democratic transition. What distinguishes the Middle East from other regions is not only the phenomenon of enduring authoritarianism but also its density and the absence of successful democratization. Much of this appears rooted in the cultural influence of Islam. Western political culture is participatory. It represents the norms, attitudes, and values of the individual and the group towards political institutions and the state. In Arab society, political culture is, in the best case, subjugated at the center and parochial at the periphery. Cultural values of honor and shame hamper Arab political culture. Traditional political culture and ethnic divisions pose a barrier to the development of effective parliamentary government and democracy. Underneath the modern veneer, the older realities of ethnicity and desert values persist. The principles of Islam are in contradiction to the values of civilian society and democracy. The source of authority and sovereignty is neither a social contract nor the will of the people but God. There is no egalitarianism between leader and subject, between man and woman, Arab and non-Arab, Muslim and non-Muslim, or even between segments of society. The concepts of democracy and liberalism are rejected ab initio. The Western temptation to engage moderate Islamists is misguided. The absolutism of political Islam—and the extra-constitutional rejection of those who do not accept its precepts—raise the danger of one-man, one-vote, one-time scenarios. Many Islamist movements readily embrace the rhetoric of democracy but fail to follow its principles when no longer convenient. This was the case with Algerian Islamists who, upon winning the first round of elections in December 1991, spoke openly of changing the constitution and abandoning the democratic process. Erdoğan, while mayor of Istanbul, summed up this problem when he quipped, "Democracy is like a streetcar. When you come to your stop, you get off." Engaging Islamists undercuts democracy in other ways. Egyptian-American sociologist Saad Eddin Ibrahim described the dichotomy that exists between autocrats and theocrats. "We have had autocrats in our region, fifty years or more of autocracy, in many of our countries; actually, nearly all of our countries. Who in due course generated their mirror image? Theocrats, the Khomeinis, the bin Ladens, the Zawahiris, the Zarqawis … who are challenging the autocrats, but who also are participating with the autocrats in an unholy, unintentional alliance to squeeze and to crush the budding democrats." When Western officials embrace Islamists—even those they deem moderate—they contribute to oxygen starvation for liberals and those truly committed to democracy. Islamist groups such as the Muslim Brotherhood or Tablighi Jamaat can be dangerous in other ways. Even when they say they eschew violence, they often serve as a "recruiting agency" for more radical groups or terrorist causes. Tablighi alumni have gone on to join Al-Qaeda affiliates, for example, and many of those who joined the Muslim Brotherhood-affiliated Kurdistan Islamic Union continued, after further indoctrination, to join more radical and violent movements such as the Islamic Movement of Kurdistan or Ansar al-Islam. The Middle East is far less stable than the White House and many European leaders believe. There is little social and economic development. Both military regimes and pro-Western monarchies are shaky. The departure of U.S. troops from Iraq may not only lead to a vacuum in that country filled by both Sunni and Shi'i militias, but the perception that the West is weak might embolden other Islamists and lead nominally pro-Western regimes to make accommodation with Islamism. Security is declining in both Afghanistan and Pakistan. Only the Ethiopian army prevents a whole-scale Islamist takeover in Somalia. Washington bases its policy toward the Arab Middle East on the pillars of alliances with Egypt, Saudi Arabia, and Turkey. The population in each country, however, is fiercely anti-American. While Turkey appears stable in the short term, both Egypt and Saudi Arabia face uncertain succession. Both have already weathered Islamist threats to their security with their government secured only through significant military and security investment. Al-Qaeda continues to target both. Bin Laden's deputy Ayman al-Zawahri comes from Egyptian Islamic Jihad. Bin Laden has repeatedly denounced the Saudi government as illegitimate and called for its overthrow. On March 1, 2003, for example, he called for Muslims to revolt against Saudi Arabia and, the following year, complained, "In Saudi Arabia, it is the king and not God who commands sovereignty and complete obedience … I advised the government two decades ago to remedy the situation ... but it has not changed at all," he declared in a December 2004 statement. The Islamic Republic of Iran, meanwhile, is overconfident. Iranian leaders already feel themselves the paramount power in Iraq and, perhaps, Lebanon. The Supreme Leader has referred to Iran as a "superpower." Over the past year, Iranian officials have expanded their influence in Gaza and have questioned the sovereignty of Bahrain, a majority Shi'i sheikhdom ruled by a Sunni leader. Islamist terrorist groups are well-established in Somalia and increasingly active in Yemen, and together threaten the Gulf of Aden and, by extension, access to the Suez Canal. Scholars and policy experts find attractive the notion that political Islam is a spent force. Repeatedly, they have been proven wrong. Today, Islamism is rising not only in Egypt and Pakistan but also in once-secular countries such as Turkey. In of each these cases and in states including Algeria, Tunisia, and Saudi Arabia, only the military prevents further Islamist gains. But like the proverbial boy with his finger in the dike, armies dependent upon recruits for ever more conservative societies cannot forever hold off the flood. It is quite possible that the Middle East and South Asia might look quite different a decade from now. It would be wise for Western policymakers to consider the possibility rather than continue to assume that the militaries that imposed security in the past will continue to repel Islamism in the future. The Economist (London), Nov. 16, 2006. See, for example, Rupert Emerson, From Empire to Nation: The Rise of Self-Assertion of Asian and African Peoples (Cambridge: Harvard University Press, 1960); Samuel P. Huntington, Political Order in Changing Societies (New Haven: Yale University Press, 1968). Howard W. Wriggins, The Ruler's Imperative: Strategies for Survival in Asia and Africa (New York: Columbia University Press, 1969). Michael Bratton and Nicholas van de Walle, Democratic Experiments in Africa (Cambridge: Cambridge University Press, 1997), pp. 82-97; Houchang Chehabi and Juan J. Linz, "A Theory of Sultanism," in Chehabi and Linz, eds., Sultanistic Regimes (Baltimore: Johns Hopkins University Press, 1998), pp. 3-48. Amos Perlmutter, The Military and Politics in Modern Times (New Haven: Yale University Press, 1977), pp. 104-5, 145-7; Michael Herb, All in the Family: Absolutism, Revolution, and Democracy in the Middle Eastern Monarchies (Albany: State University of New York Press, 1999), pp. 21-50. Al-Hayat al-Jadida (Ramallah), July 17, 2006. Zachary Abuza, "Jemaah Islamiyah Adopts the Hezbollah Model," Middle East Quarterly, Winter 2009, pp. 15-26. H. Osman Bencherif, "Algeria Faces the Rough Beast," Middle East Quarterly, Dec. 1995, pp. 31-8. Steven A. Cook, Ruling but Not Governing: The Military and Political Development in Egypt, Algeria and Turkey (Baltimore: John's Hopkins University Press, 2007), pp. 13, 133-8. "Islamizing Egyptian Education," Middle East Quarterly, Summer 2009, pp. 76-7. Ido Zelkovitz, "Fatah's Embrace of Islamism," Middle East Quarterly, Spring 2008, pp. 19-26. Michael Rubin, "Who Is Responsible for the Taliban?" Middle East Review of International Affairs, Mar. 2002. Daily Times (Lahore), Mar. 2, 2007; Najmuddin A Shaikh, "Analysis: Implications of the Swat Deal," Daily Times, Feb. 22, 2009. David Caprezza, "Turkey's Military Is a Catalyst for Reform," Middle East Quarterly, Summer 2009, pp. 13-23. Financial Times, July 31, 2003. Soner Cagaptay, "Turkey's Secret Power Brokers," Newsweek International, Mar. 30, 2009. Open Letter to President Obama, Mar. 10, 2009. Albert Hourani, Arabic Thought in the Liberal Age: 1798-1939 (London: Oxford University Press, 1970), pp. 291-323. Arab Human Development Report 2002 (New York: U.N. Development Programme, 2002), pp. 2-5. Moisés Naím, "What Is a Gongo?" Foreign Policy, May/June 2007. Sharq (Tehran), Jan. 2, 2006; Halim Barakat, The Arab World: Society, Culture, and State (Berkeley: University of California Press, 1993), pp. 273-5. Dankwart Rustow, "Transition to Democracy: Toward a Dynamic Model," Comparative Politics, Apr. 1970, pp. 350-1. "Map of Freedom in the World, Tables and Charts: Combined Average Ratings: Independent Countries, 2008," Freedom in the World, 2008 (Washington, D.C.: Freedom House, 2008), accessed Apr. 20, 2009. Mustapha K. al-Sayyid, "The Concept of Civil Society and the Arab World," in Rex Brynen, et. al., eds., Political Liberalization and Democratization in the Arab World (Boulder: Lynne Rienner, 1995), pp. 131-48; idem, "International Dimensions of Middle Eastern Authoritarianism," in Oliver Schlumberger, ed., Debating Arab Authoritarianism: Dynamics and Durability in Nondemocratic Regimes (Stanford: Stanford University Press, 2007), pp. 215-6. Elie Kedourie, Democracy and the Arab Political Culture (London: Frank Cass, 1994), pp. 103-5. Eva Bellin, "Coercive Institutions and Coercive Leaders," in Marsha Pripstein Posusney and Michele Penner Angrist, eds., Authoritarianism in the Middle East: Regimes and Resistance (Boulder: Lynne Rienner, 2005) pp. 21-41. Marsha Pripstein Posusney, "The Middle East Democracy Deficit in Comparative Perspective," in Posusney and Angrist, Authoritarianism in the Middle East, p. 2; Nicola Pratt, Democracy and Authoritarianism in the Arab World (Boulder: Lynne Rienner, 2007), pp. 189-204. Frederic L. Pryor, "Are Muslim Countries Less Democratic?" Middle East Quarterly, Fall 2007, pp. 53-8. Michael Herb, "Princes, Parliaments, and the Prospects for Democracy in the Gulf," in Posusney and Angrist, Authoritarianism in the Middle East, pp. 169-91. Fouad Ajami, The Dream Palace of the Arabs (New York: Pantheon Books, 1998), p. 155; Philip Carl Salzman, "The Middle East's Tribal DNA," Middle East Quarterly, Winter 2008, pp. 23-33. Daniel E. Price, Islamic Political Culture, Democracy, and Human Rights: A Comparative Study )Westport: Praeger, 1999), pp. 137-56, 177-86. Bernard Lewis, Race and Color in Islam (New York: Harper and Row, 1971), pp. 28-36, 54-61, 85-91; idem, Race and Slavery in the Middle East: An Historical Enquiry (New York: Oxford University Press, 1990), pp. 1-6. Saad Eddin Ibrahim, "Dissent and Reform in the Arab World," conference transcript, The American Enterprise Institute, Washington, D.C., Jan. 13, 2006. "America's Image Slips," Pew Global Attitudes Project, Washington, D.C., June 13, 2006.
 International Islamic News Network, Dec. 16, 2004; Rediff India Abroad, Dec. 16, 2004. Abrar (Tehran), Nov. 27, 2008. See, for example, Ray Takeyh, "Islamism, R.I.P," National Interest, Spring 2001. Related Topics: Middle East politics | David Bukay | Summer 2009 MEQ receive the latest by email: subscribe to the free mef mailing list This text may be reposted or forwarded so long as it is presented as an integral whole with complete and accurate information provided about its author, date, place of publication, and original URL.